New from Weise®, the Dakar Adventure Jacket and Trousers are built to handle the wide variety of conditions experienced in overland travel. Weather protection is provided by a waterproof drop liner, 120-gram thermal lining and winter neck guard, all of which can be removed as conditions improve. When the temperature rises, large panels at the chest and back can be unzipped and stowed away, revealing large vents. These work with long, two-way zipped vents that run from the cuff to the top of the arm, to maximise air flow. The Dakar Jacket is also hydration pack prepared, with a rear pocket and drinking tube outlet, so the rider can keep fluid levels topped up on the move. Level 2 CE-approved protectors at the shoulders and elbows provide top-of-the-range impact protection. Produced from highly flexible Elastofoam®, the low-profile protectors curve to fit the wearer, for a comfortable unobtrusive fit. A CE-approved back protector is fitted too. A selection of external and internal pockets, plus a removable large rear map pocket/bum-bag, offer plenty of flexibility for carrying smaller items. 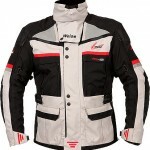 The Weise® Dakar Adventure Jacket comes in sizes S-5XL in Black and M-5XL in Black/Stone, retailing for £259.99 including VAT; matching Dakar Trousers sell for £199.99. Like the jacket, Dakar Adventure Trousers feature a waterproof/breathable layer and 120-gram thermal lining, both of which are removable; a raised section at the back of the waist gives additional weather protection. Two large zipped vents at the thighs open to allow a cooling flow of air on warmer days, and the panels can be stowed neatly out of the way when open. There’s an outside leg zip for easy access, complete with a Velcro® storm flap. A lower leg zip expander section helps with bulky riding boots. Stretch panels and adjusters allow for a snug and comfortable fit, and for the use of base layers. 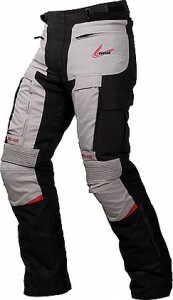 Level 2 CE-approved armour at the knees, plus pockets for optional hip protectors, offer extra impact protection. A reinforced seat panel adds durability, plus there are two concealed external waist pockets with zip closure and two cargo pockets, in case extra storage is needed. All Weise products are covered by a 2-year no-quibble warranty.